This text gives a thorough and analytical review of the treatment options for post-operative pain, using acupuncture. 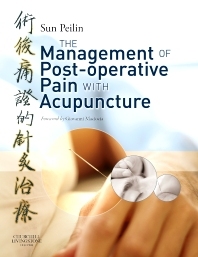 Based on the clinical experience of the author and supported by that of acupuncturists in Chinese universities, the book offers a comprehensive and detailed set of treatments for a wide variety of post-operative pain symptoms and conditions, and includes detailed modifications of the treatments, to aid clinical practice. Over thinking. Excessive anger. Excessive sadness. Application of four methods of diagnosis. Master of the syndromes prior to the operation. Moxibustion. Electric Stimulation. Cutaneous Needle. The Three - Edged Needle. The Intradermal Needle. Point Injection. Auricular Acupuncture. Scalp Acupuncture. Dr Sun Peilin, Professor of Medicine, Guangxi College of Traditional Chinese Medicine and Jiangxi College of Traditional Chinese Medicine, China; Professor in Traditional Chinese Medicine, Jing Ming College of Oriental Medicine, Belgium.